This is what happens when you don’t clean out your garage often enough. What they got right: There’s some good fight moments and the “Live Kree Or Die” storyline is moving well enough, as it chronicles Warbird’s fall. 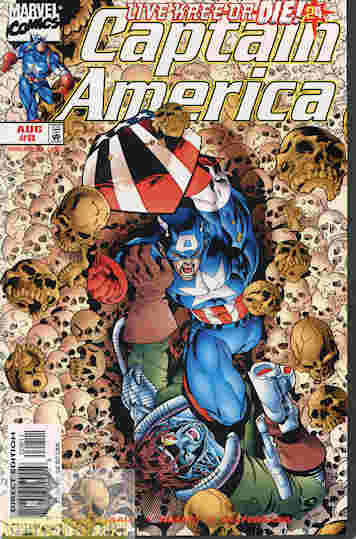 The tie-in to the concentration camps works given Cap’s history. What they got wrong: But it’s less a crossover storyline and more “here’s Warbird and the Kree splinter group popping in on their world tour”. It’s also a shame seeing Carol fall like this, especially when you look at where the character is in 2018. Maybe it’s in a story I missed, but where did the Lunatic Legion get their hands on Terrigen mists? Recommendation: The story isn’t bad and I’m interested in it but not completely enjoying it. Might be worth a look by the time this four-parter is done. We’ll see in the next two weeks. Posted by ShadowWing Tronix on April 17, 2018 in Marvel Spotlight, Yesterday's Comics and tagged Captain America, Carol Danvers, Live Kree Or Die, Lunatic Legion (Kree), Marvel Comics, Marvel Universe, Steve Rogers, Warbird.